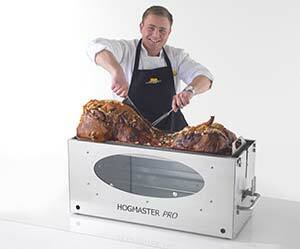 Hire A Hogmaster Pro From Hog Roast Brixham! Hog Roast Brixham may be renowned hog roast caterers, but we also do much much more than that! As part of our service we can plan and create bespoke menus for you and your guests and can even recommend other companies for various aspects of your event due to the many connections and professional relationships we have built over the many years we have been hog roasting. In addition to this, not many people know that Hog Roast Brixham actually operates a factory in the north west of England where all of our fantastic machines are designed and built. 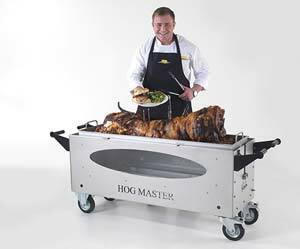 We have so much faith in and experience using our Hog Roast Brixham machines, that we can be confident in their usage and are able to hire and sell the machines to the public. One such customer, keen to take us up on our offer of machine hire was Ken. Ken had previously booked us for a private function and so knew just how delicious slow roasted food can taste and decided he wanted to give it a go himself. Our Hog Roast Brixham team were of course eager to help and put him in touch with our factory manager who arranged for Ken to come and view our full range of hog roasting machines. 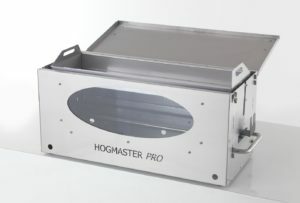 We are sure to have a machine for all your hog roasting needs, so it is no wonder that we are the industry leaders. Ken was suitably spoiled for choice when it came time to pick which machine to hire but after careful deliberation, he settled on the Hogmaster Pro. The Hogmaster Pro is a small but mighty machine! Perfect for both indoor and outdoor use and capable of cooking a small hog for your friends and family. Ken decided this would be the perfect starting point on his hog roasting endeavours and we couldn’t agree more!